Class II division 1 malocclusion is the most common malocclusion seen in day-to-day practice. The majority of the patients with class II division 1 malocclusions have the presence of underlying skeletal discrepancy between maxilla and mandible. 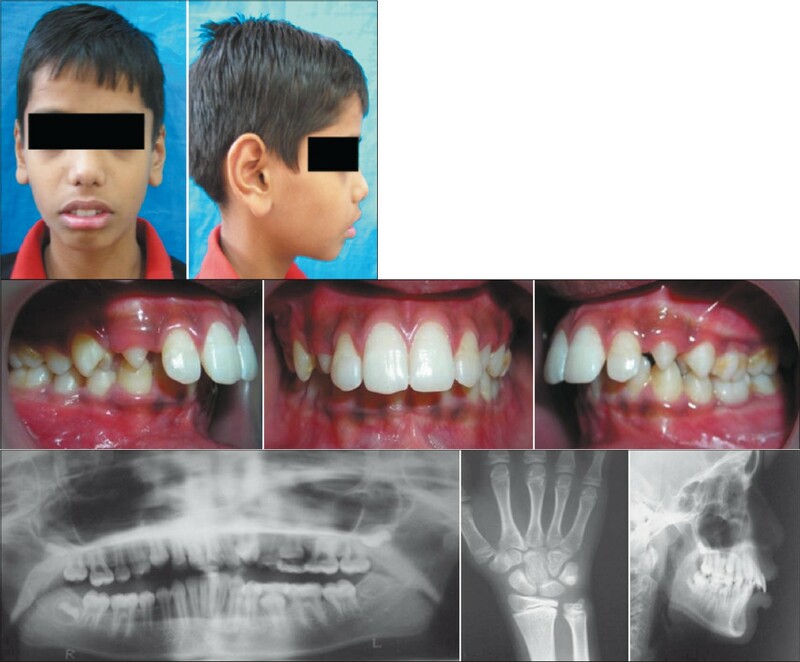 The treatment of skeletal class II division 1 depends upon the age of the patient, growth potential, severity of malocclusion, and compliance of patient with treatment. Myofunctional appliance can be successfully used to treat growing patients with class II division 1 malocclusion having retrusive mandible. 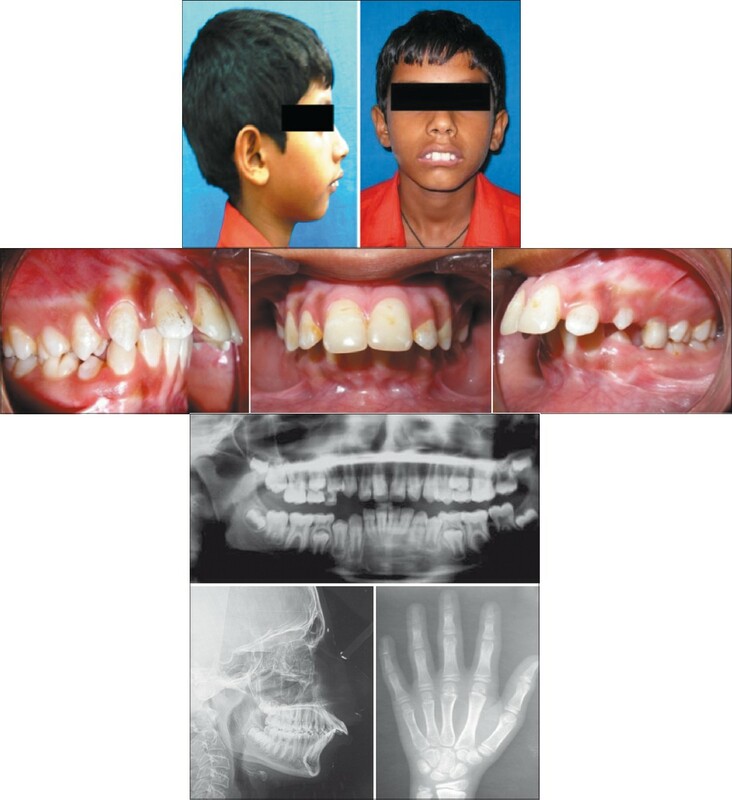 This article presents a discussion on treatment of class II division 1 due to mandibular deficiency with growth modification approach using myofunctional appliances and a series of three case reports of treatment of skeletal class II division 1 malocclusion using myofunctional appliance followed by fixed mechanotherapy. Growth modification is the interceptive mode of treatment modality in developing class II skeletal conditions. The goal of growth modification is to alter the unacceptable skeletal relationship by modifying the patient's remaining facial growth favorably to change the size, orientation, and position of the jaws. 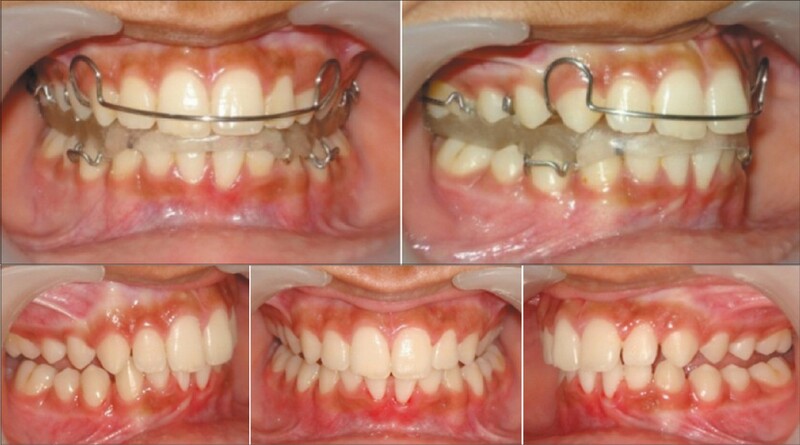 In this article, we discuss the treatment modality for class II division 1 malocclusion in growing patients. 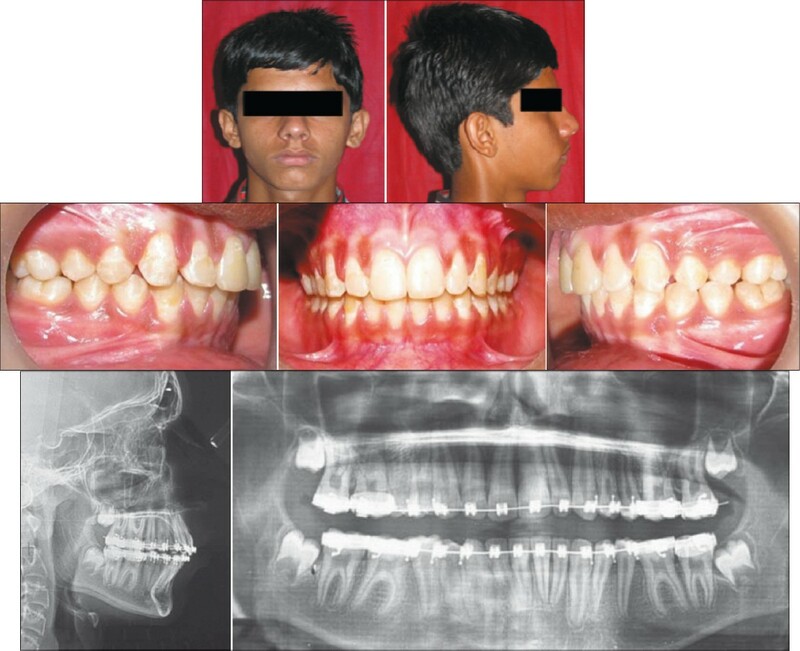 A 10-year-old male patient reported in good health with chief complaint of protrusion of upper front teeth and unpleasant looks. The dental and medical history was unremarkable. Extraoral [Figure 1]a examination showed convex facial profile with posterior divergence of the face due to retrognathic mandible. Lips were potentially competent and protrusive with 6 mm of interlabial gap, everted lower lip, and hypotonic upper lip. Intraoral [Figure 1]b examination revealed late mixed dentition stage with erupting upper canine and nearly exfoliating second deciduous molar on the left side. Dental arches were "U" shaped and maxillary anteriors were proclined with spacing. The mandibular incisors were impinging on palatal tissue on closure. In occlusion, there was a class II division 1 relationship with increased overjet of 11 mm and overbite of 8 mm. The molar relationship was class II bilaterally, with scissor bite in relation to 14 and 44. The lateral cephalogram [Figure 1]c showed a severe skeletal ANB difference of 7°. The maxilla was normal relative to the cranial base with an SNA at 80°. The mandible was retrognathic with an SNB value of 73°. The maxillary incisors were proclined. Diagnosis: Skeletal class II jaw relationship with Angle's class II division 1 malocclusion with average growth pattern. Hand wrist radiograph was taken to confirm the growing status of patient. Treatment plan: Growth modification with myofunctional appliance therapy (activator) followed by final detailing of occlusion with fixed pre-adjusted edgewise appliance. The objectives of growth modification procedure (myofunctional appliance) were to reduce the skeletal class II pattern, achieve a class I skeletal and dental relation, establish normal overjet and overbite, reduce the convex profile, and improve the lip incompetency. Myofunctional appliance (Activator) was planned for growth modification therapy. Patient was instructed to wear the activator for 14 hours/day. Results achieved: Patient's soft tissue facial profile was improved, along with lip incompetency, reduction of the severe overjet and deep impinging overbite, and achievement of class I skeletal and dental relationships [Figure 2]a. The cephalometric [Figure 2]b analysis after myofunctional therapy demonstrates favorable forward growth of the mandible. There was a reduction of the skeletal class II with a 5° decrease in the ANB angle through forward growth of the mandible. The post-treatment value of SNB at 79° indicates the advancement of mandible. At the end of treatment, the patient had pleasing soft tissue profile [Figure 3]a and well-settled dentition [Figure 3]b. 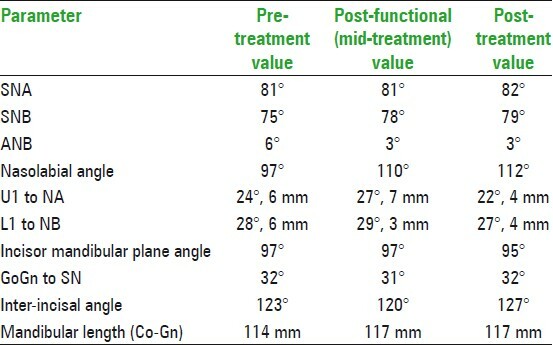 Comparison of pre-treatment and post-treatment cephalometric values is given in [Table 1]. Total treatment time was 22 months. 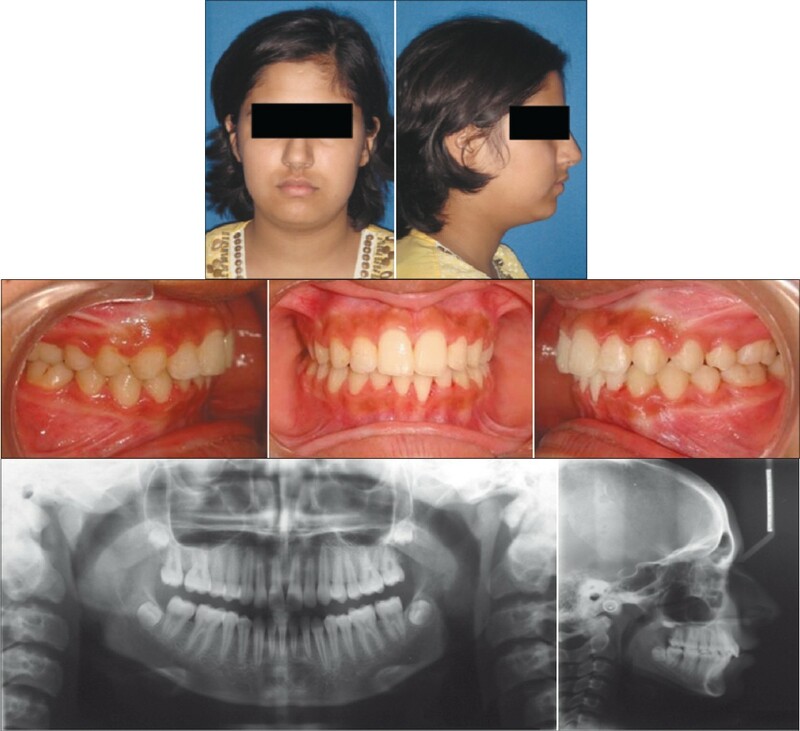 An 11-year-old girl patient presented with the chief complaints of more visibility of upper front teeth and difficulty in closing lip. Extraoral [Figure 4]a examination showed mesoprosopic facial form, convex facial profile with potentially competent and protrusive lips with 5 mm of interlabial gap, hypotonic upper lip, everted lower lip, retrognathic mandible, and reduced lower facial height. Intraoral [Figure 4]b examination revealed well-aligned arches, proclination of upper incisors with increased overjet of 9 mm, and deep bite of 8 mm. There was a class II molar relation and class II canine relation. Upper dental midline was coinciding with facial midline, but lower dental midline shifted to the right side by 2 mm. There was mild spacing in lower anterior teeth and curve of Spee of 3 mm on either side. The lateral cephalogram [Figure 4]c showed skeletal ANB difference of 6°. The maxilla was normal relative to the cranial base with an SNA at 81°. The mandible was retrognathic with an SNB at 75°. The maxillary and mandibular incisors were normally positioned to the apical base upper incisor to NA (6 mm, 24°), lower incisor to NB (6 mm, 28°). The patient had horizontal growth pattern. Skeletal class II due to short and posteriorly placed mandible with horizontal growth pattern, dental Angle's class II division1 malocclusion. Growth modification with myofunctional (twin block) [Figure 5]a appliance to advance the retrognathic mandible, followed by fixed mechanotherapy for final detailing of occlusion. Saggital correction (class I) was achieved through growth modification by myofunctional appliance [Figure 5]b and there was improvement in the facial profile and lip incompetency [Figure 6]a and reduction of the severe overjet and deep overbite. Evaluation of the cephalometric tracings demonstrates reduction of the skeletal class II with a 3° decrease in the ANB angle through forward growth of the mandible. The post-treatment value of SNB was at 78°. 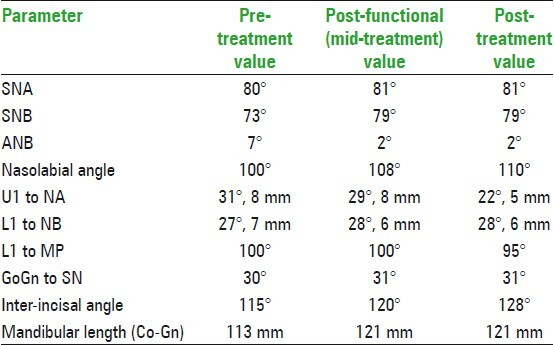 At the end of the treatment, the patient had very good facial profile, competent lips class I molar and canine relationship, normal overjet and overbite [Figure 6]b, root parallelism, and normal tooth position [Figure 6]c. Comparison of pre-treatment and post-treatment cephalometric values is given in [Table 2]. Treatment duration was 18 months. 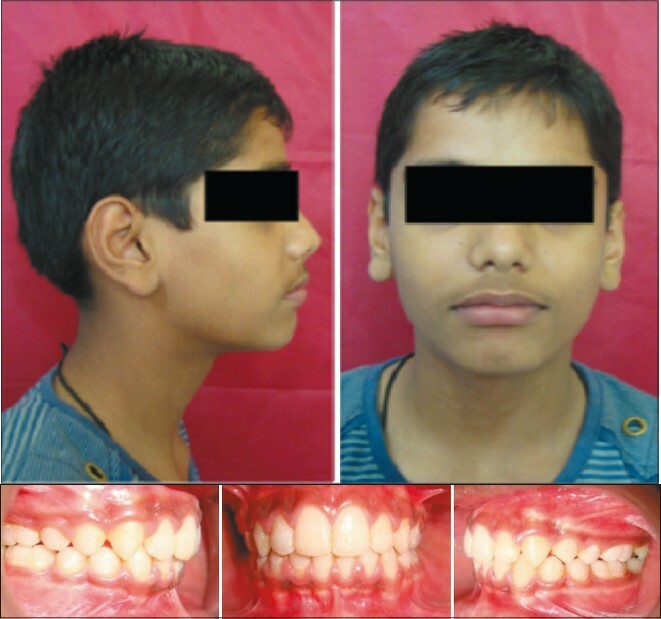 An 11½-year-old boy patient reported with the chief complaints of forwardly placed upper front teeth and unpleasant looks. Extraoral [Figure 7]a examination revealed a convex profile mainly due to retrognathic mandible, incompetent protrusive lips with 7 mm of interlabial gap, upturned prominent nose, deep mentolabial sulcus, and lower lip trap habit. Intraoral examination [Figure 7]b of dentition revealed mixed dentition stage. Maxillary and mandibular arch were ovoid in shape with proclined upper incisors and generalized spacing. In occlusion, there was Angle's class II division 1 relationship with overjet of 13 mm. The overbite was 6 mm. The molar relationship was class II bilaterally. Canine relationship was class II on the right side and was not established on the left side. Upper and lower dental midlines were coinciding with each other and with facial midline. The lateral cephalometric values [Figure 7]c showed a convex hard tissue profile with a severe skeletal ANB difference of 7°. The maxilla was slightly prognathic relative to the cranial base with an SNB at 83°. The mandible was retrognathic relative to the cranial base with an SNB at 76°. There was proclination of upper and lower incisors with average growth pattern. Angle's class II division 1 dentoalveolar malocclusion on class II skeletal base due to retrognathic mandible. Growth modification with myofunctional appliance therapy (activator) [Figure 8]a immediately followed by final detailing of occlusion with fixed pre-adjusted edgewise appliance was planned. 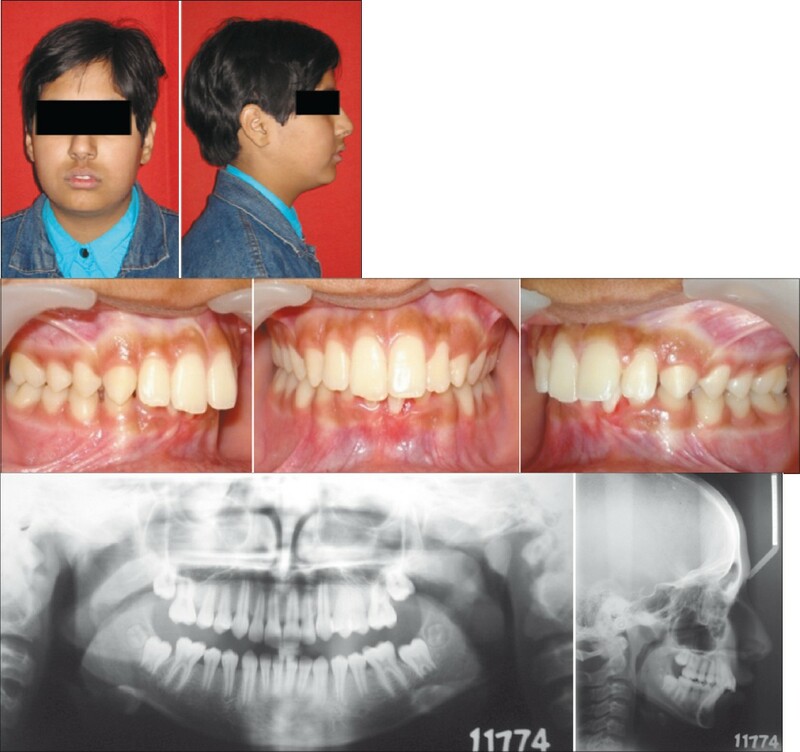 Saggital correction (skeletal class I) was achieved through growth modification [Figure 8]b with improvement in the facial profile and lip incompetency and reduction of the severe overjet and deep overbite. At the end of the treatment, the patient had very good facial profile [Figure 9]a, class I molar and canine relationship, normal overjet and overbite [Figure 9]b, root parallelism, and normal tooth position. Evaluation of the cephalometric [Figure 9]c tracings demonstrates reduction of the skeletal class II with a 4° decrease in the ANB angle through forward growth of the mandible. The post-treatment value of SNA was 82° and of SNB was 79°. Proclination of upper as well lower incisors was also corrected. 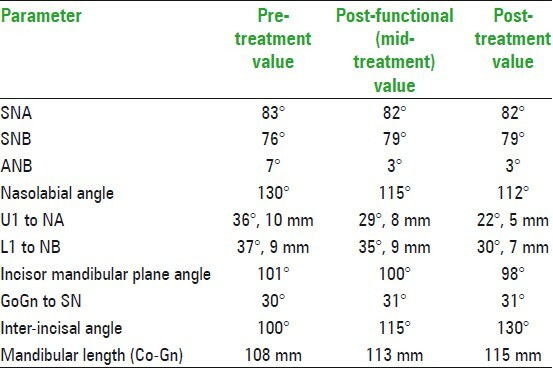 Comparison of pretreatment, mid treatment and post treatment Cephalometric values is given is [Table 3]. Over the years, the use of functional appliances has received mixed results. It is important to note that functional appliance therapy is to be generally followed by the traditional full fixed appliance treatment for optimum results, since they deal more with the gross changes in the intermaxillary relations and arches. Functional appliances are not designed for precise individual tooth movements. For children with moderate to severe class II division 1 malocclusion problems, growth modification is a successful approach. Mandibular retrognathism can be successfully treated by myofunctional appliances. Whenever required, it can be followed by comprehensive fixed appliance treatment for detailing of occlusion. Patient cooperation and repeated motivation is a critical factor while trying for growth modification in adolescent children. Case selection and diagnosis is critical. Manipulation of appliance, growth amount, and direction are the major factors to be considered. 1. McNamara J. Component of Class II malocclusion in children 8-10 years of age. Angle Orthod 1981;51:177-202. 2. 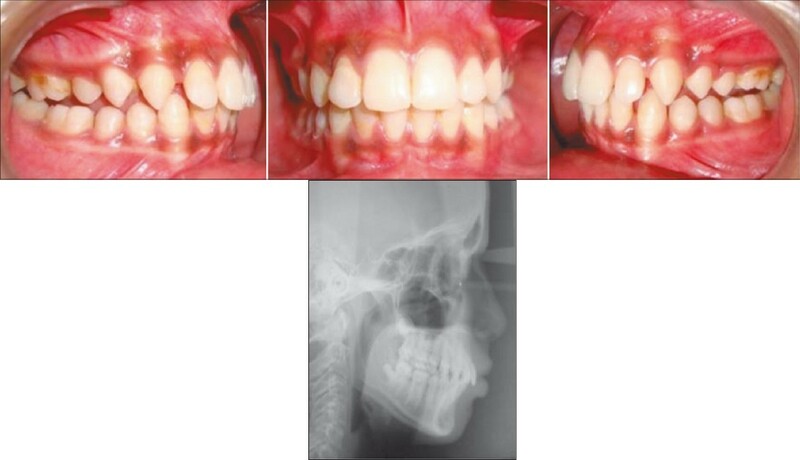 Tulloch JF, Proffit WR, Phillips C. Influences on the outcome of early treatment for Class II malocclusion. Am J Orthod Dentofacial Orthop 1997;111:533-42. 3. Hsieh TJ, Pinskaya Y, Roberts WE. Assessment of Orthodontic Treatment Outcomes: Early Treatment versus Late Treatment. Angle Orthod 2005;75:162-70. 4. King GJ, Keeling SD, Hocever RA, Wheeler TT. The timing of treatment for Class II malocclusion in children; a literature review. Angle Orthod 1989;60:87-97. 5. Dugoni SA. Comprehensive mixed dentition treatment. Am J Orthod Dentofacial Orthop 1998;113:75-84. 6. Tulloch JF, Phillips C, Proffit WR. Benefit of early Class II treatment: Progress report of a two-phase randomized clinical trial. Am J Orthod Dentofacial Orthop 1998;113:62-72. 7. Bowman SJ. One-stage versus two-stage treatment: Are two really necessary? Am J Orthod Dentofacial Orthop 1998;113:111-6. 8. White L. Early orthodontic intervention. Am J Orthod Dentofacial Orthop 1998;113:24-8. 9. Bishara SE. 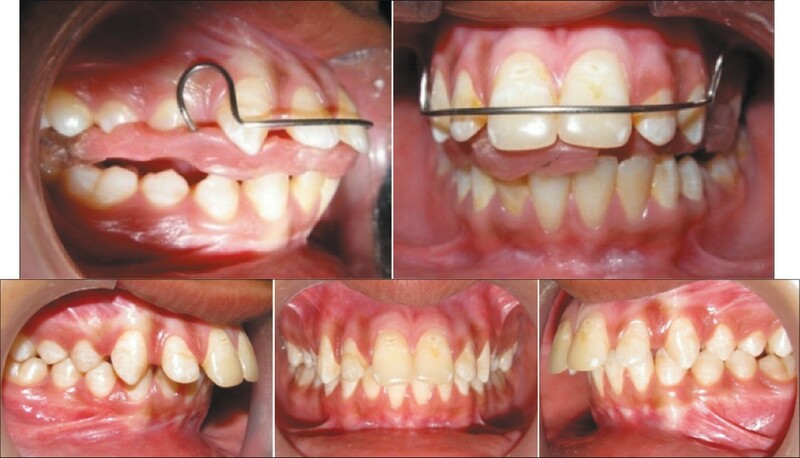 Mandibular changes in persons with untreated and treated Class II Division 1 malocclusion. Am J Orthod Dentofacial Orthop 1998;113:661-73. 10. Yang EY, Kiyak HA. Orthodontic treatment timing: A survey of orthodontists. Am J Orthod Dentofacial Orthop 1998;113:96-103. 11. Ghafari J, Shofer FS, Jacobsson Hunt U, Markowitz DL, Laster LL. Headgear versus function regulator in the early treatment of Class II, Division 1 malocclusion: A randomized clinical trial. Am J Orthod Dentofacial Orthop 1998;113:51-61. 12. Wieslander L, Lagerstrom L. The effect of activator treatment on Class II malocclusions. Am J Orthod Dentofacial Orthop 1979;75:20-6. 13. Clark WJ. : The art of Orthodontic. In Clark WJ. Twin Block functional therapy application in Dentofacial Orthopaedics; Mosby-Wolfe Publication; London;2002: p.2-4. 15. Graber TM, Rakosi T, Petrovic AG; Dentofacial orthopedics with functional appliances. Principles of functional appliances. St Louis: Mosby; 1985.